You are at:Home»Industry»Lodging Econometrics: Snapshot of Multi-Hotel Developers in the U.S. The U.S. construction pipeline kicked off the first quarter of 2018 with 5,255 projects/636,174 rooms up 4% by projects and 6% by rooms year-over-year (YOY), according to analysts at Lodging Econometrics (LE). In comparison to the highest pipeline level recorded by LE, the current quarter is just 628 projects/149,373 rooms, or 11% beneath the peak, which occurred in Q2 2008. We expect the pipeline to continue its modest growth through this year. With continued growth in the pipeline, the number of multi-developers in the industry has grown as well. There are currently 326 developers with three or more projects in the U.S. pipeline, 133 with five or more projects and 22 have 10 or more projects in the total pipeline. The states with the highest concentration of multi-developers with three or more projects are: Texas with 47; California with 29; Georgia with 22; New York with 21; Tennessee with 19; North Carolina with 14; Florida and South Carolina with 12; Indiana with 11; and Missouri with 10. LE has also recently seen a spike in the development of shared-site (683) and extended-stay projects (1,086). 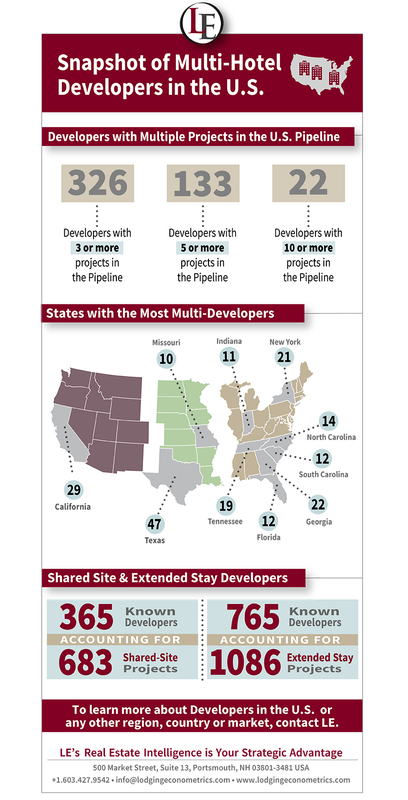 There are currently 46 developers who have more than three shared-site projects in the U.S. Pipeline. 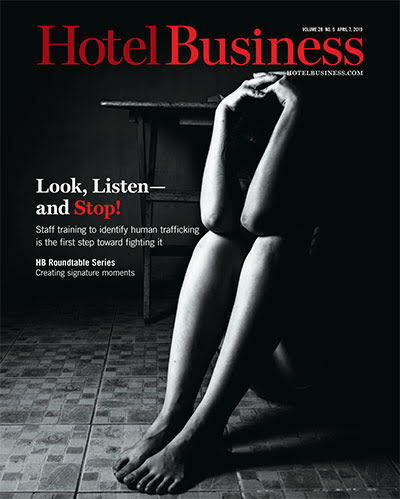 The top combination of brands for shared-site projects are: Home2 Suites by Hilton and Tru by Hilton; MainStay Suites and Sleep Inn; Courtyard by Marriott and Residence Inn; Holiday Inn Express and Staybridge Suites; and Hilton Garden Inn and Homewood Suites by Hilton. Twenty-one percent of the projects in the pipeline are extended-stay projects, while 765 individual known developers account for the 1,086 extended-stay projects. Fifty-five of the developers have three or more projects. The top extended-stay brands are Home2 Suites by Hilton, Residence Inn, Staybridge Suites, and Residence Inn.